Tagged with " 3D Bioprinter"
Three-dimensional (3D) printing is a 20-year-old technology whose time finally seems to have arrived. Interest in the equipment rose sharply last year; in 2012, the market for 3D products reached $777 million and could reach $8.4 billion by 2025 as medical uses for the printers are being developed, according to Lux Research. Organ replication took a leap at a Boston hospital, as doctors finally nailed the process of artificial vascularization with the use of advances in 3D bio printing together with biomaterials in order to create the first synthetic blood vessels. Bioengineers have been working on building lab-grown organs out of a patient’s own cells, but one major challenges is to make blood vessels. Blood vessels deliver essential nutrients and dispose of hazardous waste to keep our organs working properly. Without them, interior cells quickly suffocate and die. Now a team from Brigham and Women’s Hospital in Boston, Massachusetts (BWH) has attempted to address this challenge by offering a unique method to create artificial blood vessels using hydrogel constructs that combine advances in 3D bioprinting technology and biomaterials. Researchers in the Netherlands have taken a further step towards the goal of creating human body parts with 3D printers, by using stem cells. While various scientists and researchers have experimented with the 3D bioprinting of human tissue, most of these have concentrated on a single type of cell, such as the printing of heart cells, as we reported on in March. However, researchers at Utrecht University in the Netherlands are experimenting with human stem cells. „Wie gedruckt!“ – Dieser Ausdruck könnte zukünftig auch für nachgezüchtete Organe aus dem 3D-Drucker gelten. Ob Haut oder Herz, die Forschungen daran kommen voran. Dafür werden auch Tierversuche unternommen. A US company is planning to produce kidney tissue using a 3D printer and technology developed by a scientific research firm in Australia. The University of Queensland’s commercialisation company, UniQuest, has signed an agreement with San Diego-based 3D bio-printing company to replicate a kidney with 3D printing. Künstliche Organe lassen sich mittlerweile durch Verfahren wie 3D-Druck herstellen. Nun haben Forscher erstmals auch Blutgefäße hergestellt. Australian and European students will soon learn how to use 3D printing to create human body parts, with a world’s first master’s degree to be offered by four of the world’s leading research universities. There’s something a little creepy-sounding about the phrase “lab-grown organs,” but producing human organs in the lab could have a range of such powerful benefits that, if they became widely available, only the rare patient would get hung up on the creep factor. A liver, for example, made from human cells could be used as an intermediate step in drug testing in order to help ensure that a drug was safe before testing it on people. And, yes, a bladder or pancreas or even a heart developed from a patient’s own cells could be transplanted, cutting the wait time for a donor organ and all but eliminating the risk that the patient would reject the organ. EnvisionTEC, often known for its high resolution digital light processing (DLP) 3D printers, is also in the business of manufacturing machines for 3D bioprinting. 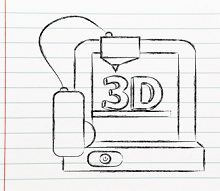 And the company has just announced that it is releasing an upgrade to its previous 3D-Bioplotter machine in addition to a new Developer Series model. The EnvisionTEC 3D-Bioplotter® 3D printing technique may be described as the deposition of multiple materials in three dimensions using pressure. Materials range from a viscous paste to a liquid, and are inserted using syringes moving in three dimensions. Air or mechanical pressure is applied to the syringe, which then deposits a strand of material for the length of movement and time the pressure is applied. Parallel strands are plotted in one layer. For the following layer, the direction of the strands is turned over the center of the object, creating a fine mesh with good mechanical properties and mathematically well-defined porosity.